website to reflect their bold and unique attitude towards corporate branding and gifting. Creative Brands is a fun-loving Cape Town-based team who provide an online solution for promotional gifts, branding and printing. 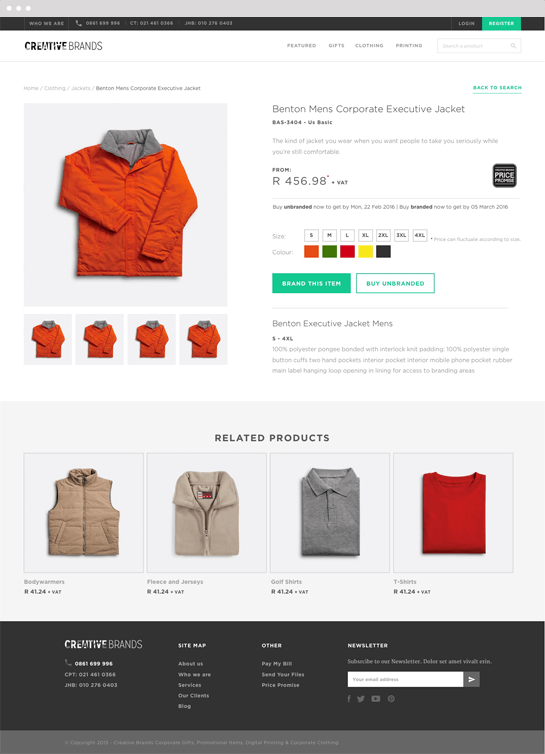 The unique service allows customers to select products on the website (including clothing and other merchandise), tailor it to their needs and add their branding. Brands can extend their reach in a collaborative way and have more control over the entire process. 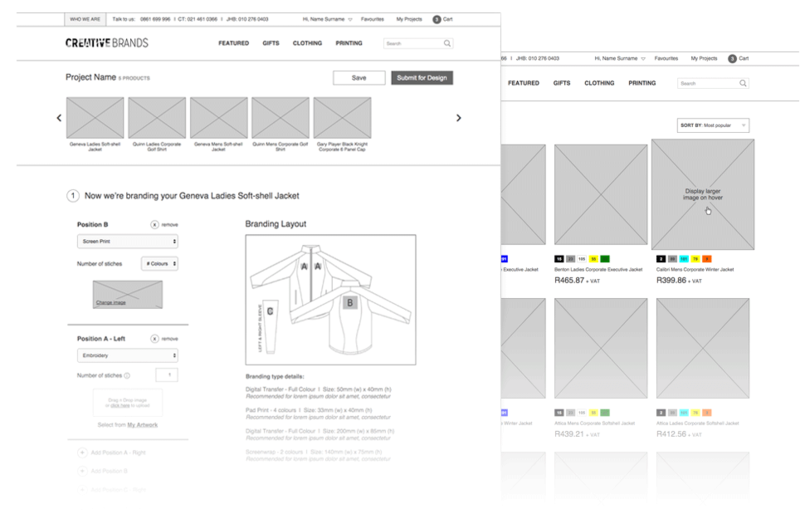 Isoflow helped with the introduction of new UX functionality and flows where the user can now complete the entire branding process on the site. We also helped improve the look and feel of the site by injecting more of their personality into the designs. Their existing website provided a good base to work from when introducing new functionality to the navigational flow. We worked closely with the Creative Brands team on mapping out and workshopping user journeys and wireframes before we got started on the design process. The Creative Brands website provides users (small or big businesses) with the opportunity to get quotes, see pricing and order their products. The collaborative process allows clients to see the projects they have in progress, provide feedback on designs, view previous orders, manage their accounts and organise delivery. This vibrant, bold attitude to branding is reflected in the website design which we helped neaten up, using a cleaner style to make the information easier to understand. We also added in new features such as the mega menu for a better user experience. "I really enjoyed working with Isoflow because they know how to take a complex business problem and effortlessly create a solution that not only works but looks beautiful too." We wanted the design to emphasise the professionalism and simplicity of the branding process on their site. We did this through keeping a consistent and clean style across elements, making use of card layouts and a minimal colour palette.